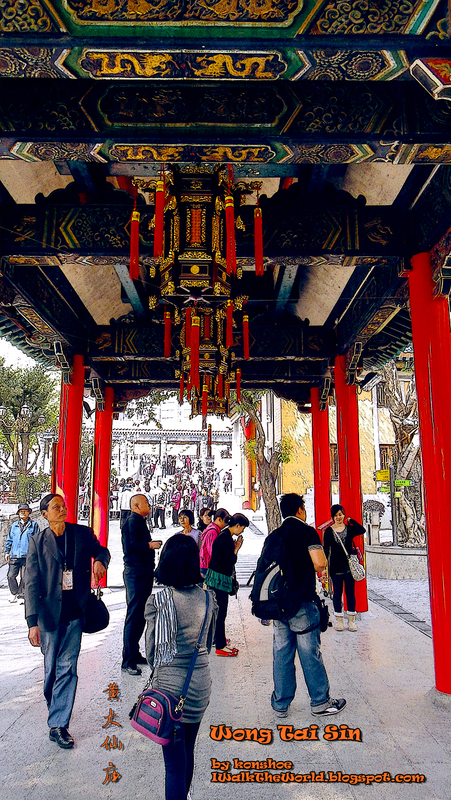 Standing in the shadow of the patron deity of the temple was another equally famous and crowd-attracting deity. 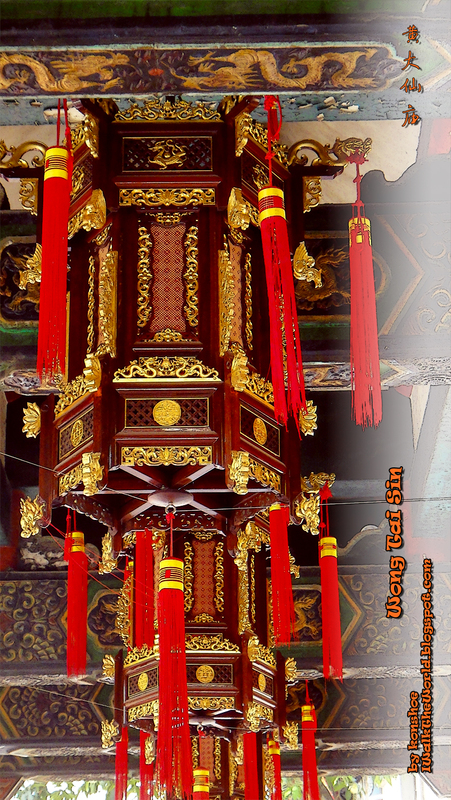 He was the god of marriage of love, the old man under the moon, the one known as Yue Lao (月老). In Chinese mythology, belonging neither to Buddhism nor to Taoism specifically, he was the equivalent to Cupid, tying the knots between people to form couples and marriage. 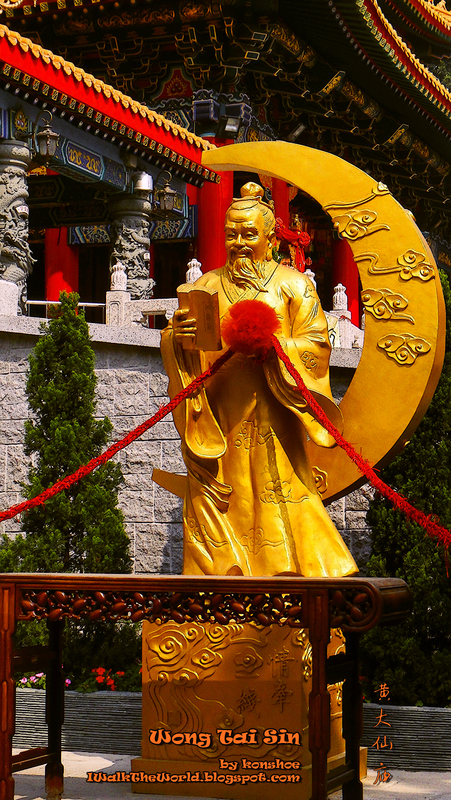 The statue of Yue Lao standing in a courtyard, waiting for the right couple to tie his red knot with. In fact, according to Red Herrings and White Elephants by Albert Jack, the term 'tying the knot' was suggested to originate from this deity. For it was his job to read from his book of marriages, in which listed the names of every couples. And he would tie a red string between the couples, signifying the union of husband and wife, thus earning the title of god of marriage. It is usually considered a good way to look for your significant others by praying to Yue Lao. Even for couples, praying to him for a good future and a healthy family of kids is not uncommon. 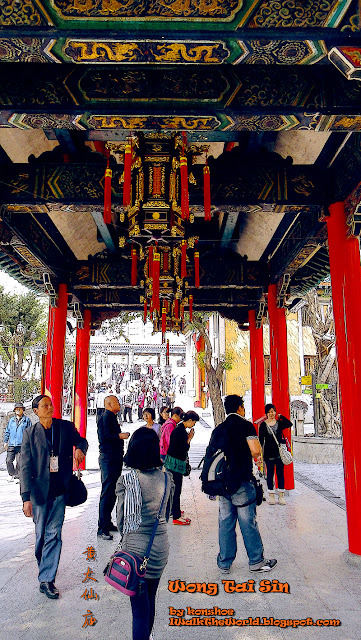 The deity resided at a side of the temple complex, with an area unto its own, to accommodate a throng that rivaled those praying to Wong Tai Sin. 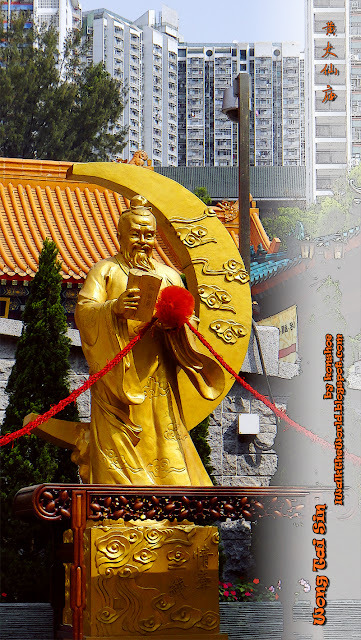 The deity did not reside solely in Wong Tai Sin temple, but in numerous shrines which were set up for believers to give their prayers to. Take the red string, which could be obtained from the workers for free, and walk in a straight line to the helper statue of the opposite gender with your eyes closed. In short, boy goes to girl statue and vice versa. Tie a knot with the red string to the long red rope connecting the helpers to Yue Lao. Pray for your wish for one last time. It was customary for couples who were successful in their marriage to return with gifts and offerings. 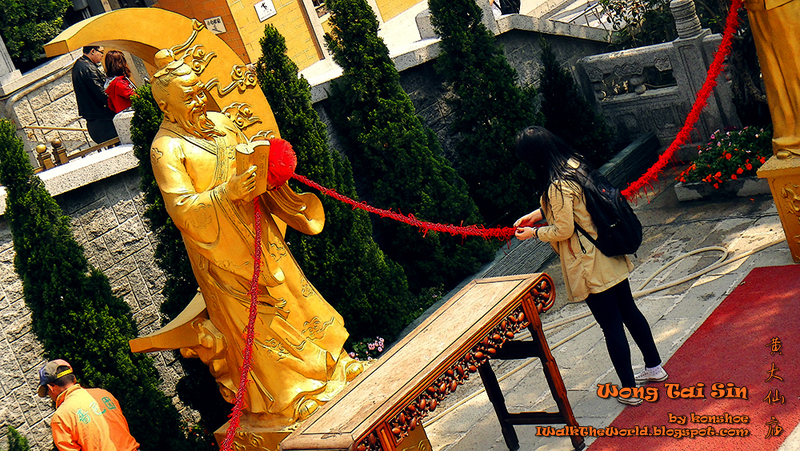 A lady tying a red knot on Yue Lao's red string, hoping for a good future husband or a good marriage. A prayer to Yue Lao and a red knot on the red lacy string connecting Yue Lao and his two helpers, a boy and a girl, was told to bring good future to a couple or an unmarried person. Most people just wanted to take a photo as well to remember their fateful meeting with Yue Lao, and with so many people looking forward to their turn, the crowd almost turn into a mob trying to grab the poor deity down. To prevent such disaster from happening, the workers quickly maintained an orderly crowd by allowing only a couple to go forth and spend their time before the next was allowed. It seemed that when it comes to personal wishes, people could get selfish and put their wish before others, afraid that the deity could miss their wish when being overwhelmed by similar wishes from others. Such, I think, is the sad fact of human nature. 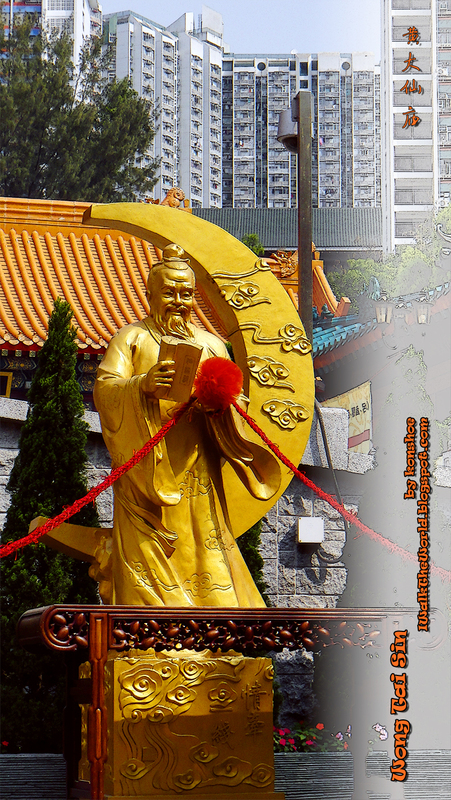 The route to and from Yue Lao's statue may not be heavily decorated, but it is worthy of its own snapshots anyway. And on my final walk, I came full circle to the front courtyard of the main temple complex, where the 12 zodiacs of Chinese culture resided, posing their best for photographs. Map taken from SikSikYuen's website. 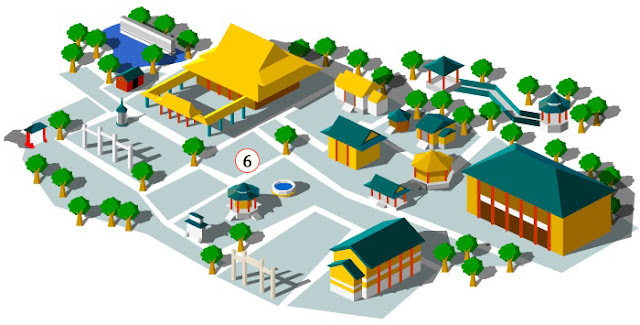 The area marked #6 is where 月老 resided. i came here tied the know with the girl i wanted to marry! but after i leave china her parents say we cant be together my life fell apart now im sick all the time and i feel when she is sad or crying we traded part our souls that day! i gave up everything to fly meet her i spent all my money and quit my job to come meet julia girl of my dreams now i feel cursed like i cant love anyone els but her! what do i do?